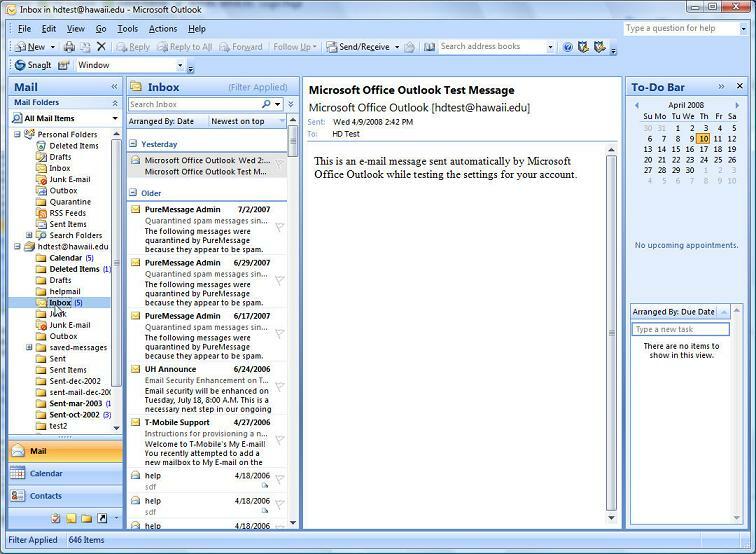 This document assumes you are using Outlook 2007 on a Windows OS platform. 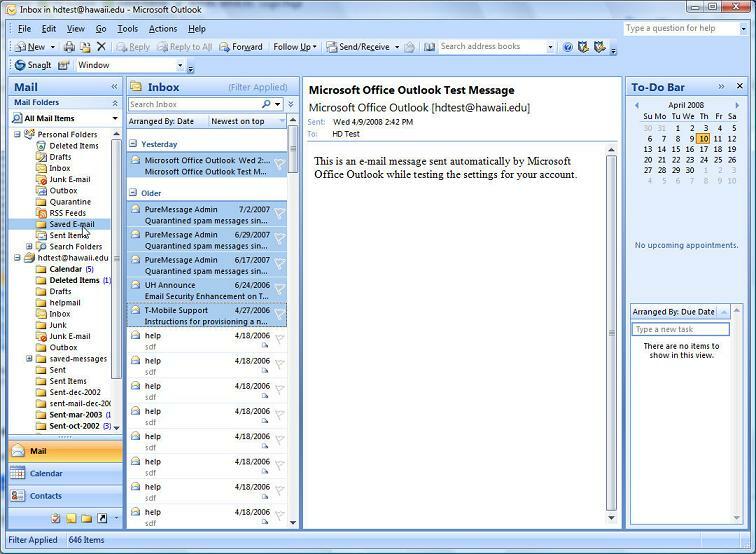 It is also assumed that Outlook 2007 has been configured to use the IMAP protocol. 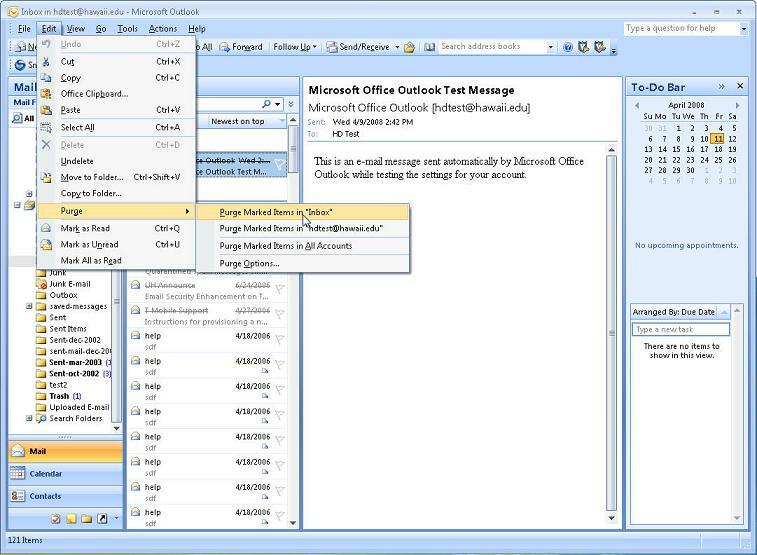 The Microsoft Outlook 2007 window is by default composed of four views. 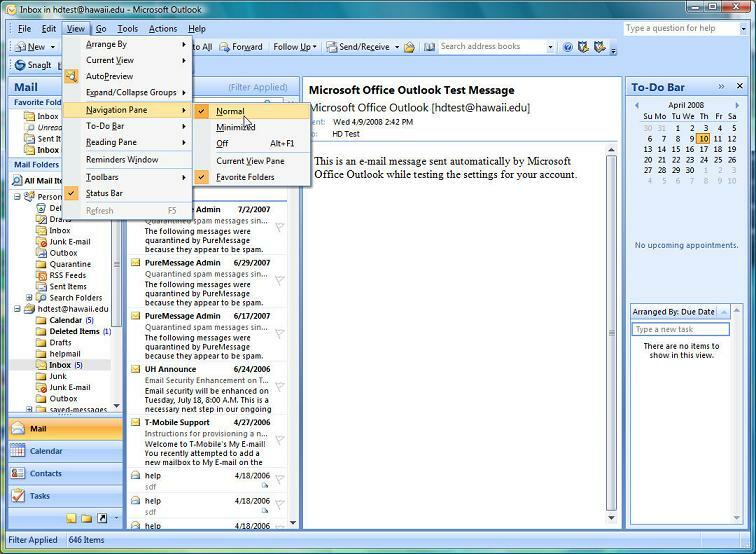 The first from left to right is the Navigation Pane, then the list of messages, followed by the Reading Pane and the To-Do Bar. Views can be added or removed by clicking View, choosing the desired pane then clicking Normal, Minimized or Off. Since the Navigation Pane is where we will be working, ensure that it is active in the Normal view. See the figure below. 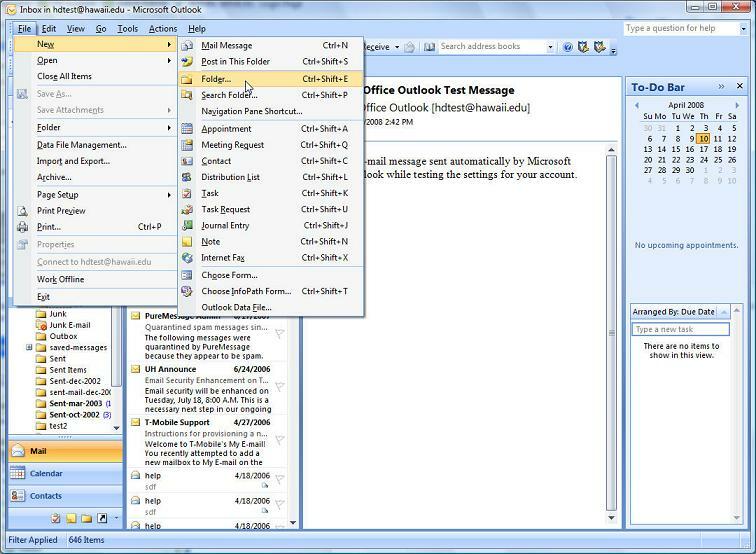 The Navigation Pane on the far left is organized under sections that denote separated mail or storage accounts. The example below demonstrates two storage accounts. 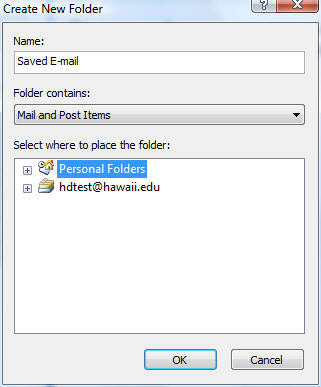 The Personal Folders account which is stored on the hard drive and the hdtest account which is stored on the UH server. The hdtest account with all the folders listed under it is an IMAP account. That means all the messages within that account is utilizing space on the server and therefore is being counted against the allotted quota. In the figure below, the messages in the Inbox of the hdtest account are the ones we are going to move offline onto our local hard drive to relieve disk space on the server. 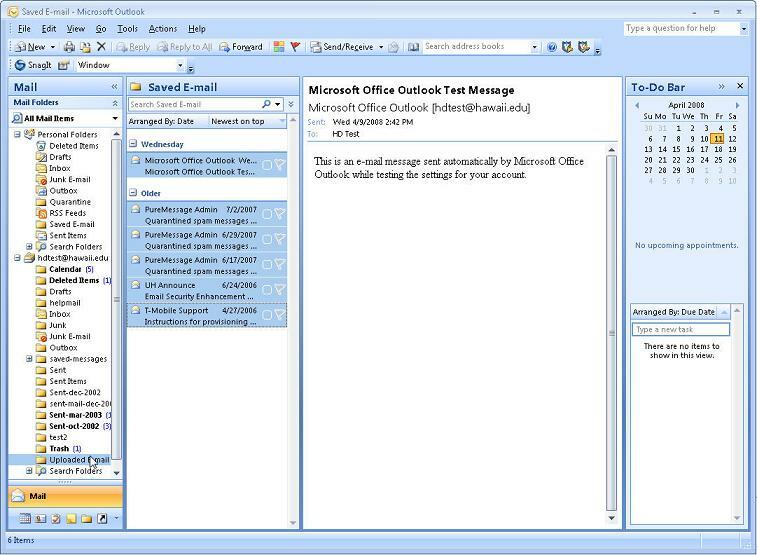 Depending on how Outlook is configured, there can be numerous accounts listed here but only one should represent the messages on the UH mail server for a particular user. Next, give the folder a name, and then click on Personal Folders. Be sure to click on Personal Folders to ensure the new folder will be created on your local hard disk. Click on the OK button to create the folder. Note that there are plus signs in front of each account below. If there are minus signs, click on them to create plus signs and to collapse the list. This will organize the list and possibly prevent confusion especially if there are numerous accounts in your Outlook profile. In the example below, collapsing the list demonstrates there are only two accounts. Now, select the email you wish to move offline and have saved in your local folder. After clicking on the folder containing the messages within the IMAP account, you can choose Edit, Select All from the menu, you can click individual messages by holding the CTL key or you can click on contiguous messages by clicking on the first message, holding the SHIFT key and clicking on the last. Once you have chosen the messages to move off the UH server, simply drag them into the new local folder that was created in the previous step. 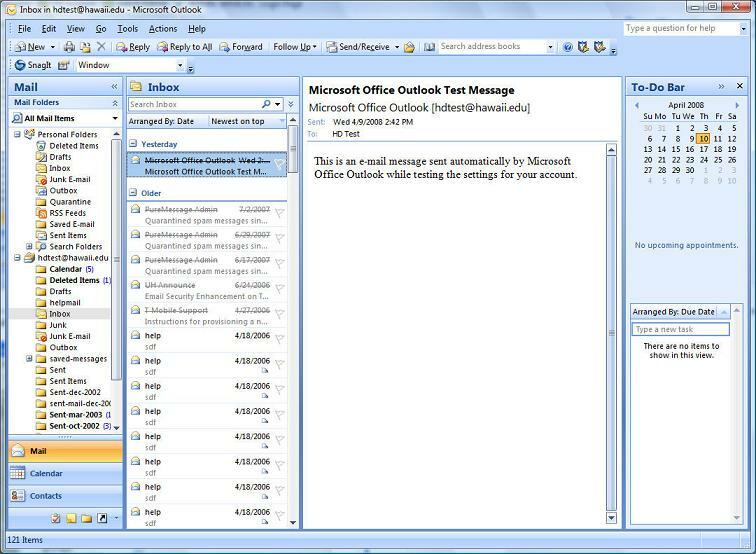 In the figure below, six email messages from the inbox of hdtest were selected and moved into the new local folder, Saved E-mail. To verify that the email has been saved to your local hard disk, click on the new folder you created (saved e-mail). The saved email messages should be listed. See figure below. Once the email messages have been moved from the UH server, a strike through line will be drawn through them. In the figure below, notice the strike through lines on the messages in the Inbox of the hdtest account. After saving all email messages to your local hard drive, it is time to purge the saved emails from the server. To do this, go to Edit, Purge and click on Purge Marked Items in "Inbox". See the figure below. This will remove the saved emails from the server and free up disk space. Note, be sure to verify that the emails have been saved correctly before doing this step. That's it, you have successfully moved the selected emails off of the server and onto your local hard drive. Go to the File menu, click New, and then click Folder. Next, give the folder a name, and then click on your IMAP account. In the following example hdtest is selected. Be sure to click on your IMAP account to ensure the new folder will be created on the server. Click on the OK button to create the folder. See figure below. Now, select the email you wish to move online to be accessed from multiple locations. 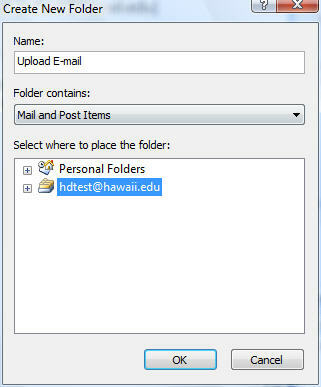 Simply drag the emails that are to be uploaded into the new online folder that was created in the previous step. 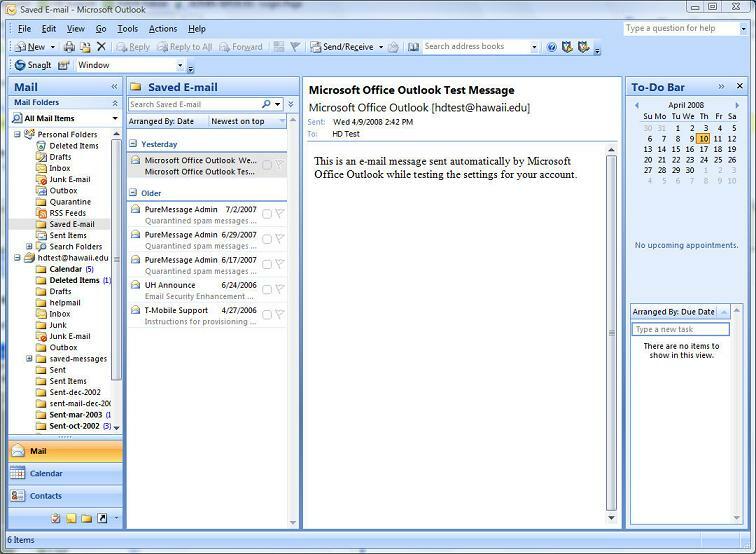 In the figure below, the email messages from Saved E-mail was selected and moved into the new online folder, Upload E-mail.